Translation, editing and proofreading of technical, creative and general text in Malay and English. Private to professional level training in a Piper Cherokee at Ramona Airport. Breeders of registered Simmental cattle and a feedlot branch. Providing consulting, information analysis and the Cow Camp Alliance. Located in Lost Springs and Ramona, Kansas, USA. Scientific and eucational illustration and design, and information graphics for advertising, websites, editorial usage. Digital and traditional media. Based in Ramona. Breeder and exhibitor in Ramona. News and pictures. News, photographs and pedrigrees of their dogs, litter announcements, and articles about the breed. Ramona. Breed standard, photograph gallery, and contact information. Ramona, California. Offering training in Ramona, California. Dealer of Hornet and Challenger ultralights. Information on their stockdog training facility, photographs of their dogs, and a calendar of events. Ramona. Contains information about a boat built for the 1968 Olympics by Driscolls in San Diego, California. With photographs. Specializing in small household animals. Their philosophy, list of services, and profiles of the staff. Ramona. Full service Arabian horse breeding facility. Own super sire Padrons Psyche. In Ramona. Creates hand-crafted wines in the Ramona Valley. Contains product descriptions, an order form, pictures, and a description of the region. Offers training and lessons in Dressage, Hunter/Jumpers, Western, Driving, Halter, and all around riding. Located in Ramona. Facility offering hourly use of arenas and cattle. Site includes descriptions and photos of amenities, and rates. Located in Ramona, California. Bred for Schutzhund, family protection and companionship. Information, links, pictures, and video files of famous GSD. Ramona, California. Online journal of a trip to Southern California and the people and places that made it real. Small animal clinic. List of services, hours of operation, staff profiles, directions, and links. East Ramona stud standing nine stallions. Includes in-depth information and six generation pedigrees, mating notes, sales results, list of stakes winners and contacts. Team Synergy is a lowered car and truck club based out of Ramona, Ca. Offers riding lessons in English and Western for riders of all ages and skill levels. Western themed facilities also available for special events and parties. Includes photographs of the facilities. Located in Ramona. Includes club meeting times, activities, and contact information. Central Texas baby born with Trisomy 13, a rare chromosome disorder. Funding for hearing aids is requested. Local chapter of worldwide service organization for women in management and professions. Includes club meeting times, activities, and contact information. Grace Community Church, Ramona, California. Thoughts on spirituality, ministry, leadership and the community of God. Review of 'Birds, Bugs, Bones.' for the San Francisco Bay trio. Spencer Beck, artist representative, specializes mostly in modern comic art, and representative for artists including Jim Aparo, Nick Cardy, Colleen Doran, Ramona Fradon, John Romita Jr. and the estate of Curt Swan. SiteBook Ramona City Portrait of Ramona in California. 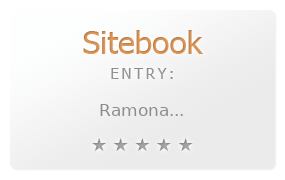 This Topic site Ramona got a rating of 4 SiteBook.org Points according to the views of this profile site.